The Ron Grimley Undergraduate Centre is a clinical teaching academy based at Russells Hall Hospital. We first opened our doors to medical students in 2005. Since then we have continued to develop a framework to deliver a high standard of medical education. Our superb learning facilities in a modern, purpose-built education centre offers students both formal and informal learning opportunities. 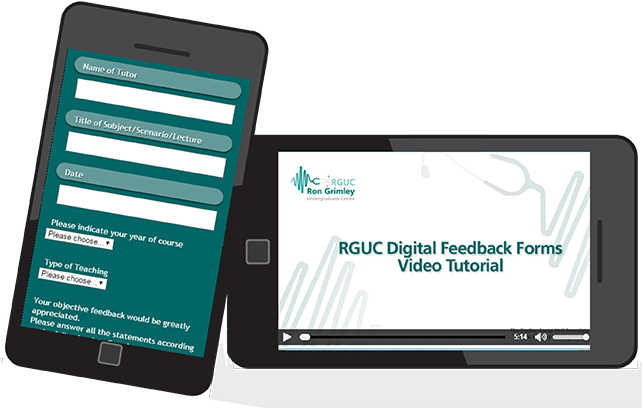 Our digital feedback form system helps students to easily provide feedback regarding the teaching they receive. Feedback data is collated by undergraduate coordinators, who then issue feedback results to academy tutors and teachers. The forms can be accessed via the links below, or students can scan the QR codes using their mobile device. QR codes are pinned to the wall in all our seminar rooms. Have you seen the latest A to E episodes? We aim to deliver technology-enhanced, innovative, high quality, medical education which is fit for purpose in the 21st century. Provide a positive and safe educational environment for learning. Equip the generation of future doctors with knowledge and skills to meet the ever increasing patient expectation. Provide training placements that are safe and educationally reliable. Nurture and encourage the development of our medical students into the future medical workforce, who are professionally and emotionally competent. Mr Atiq Rehman was appointed as head of teaching academy in 2010 following his initial appointment as Clinical Sub Dean for Russells Hall Hospital, and worked as Ron Grimley’s junior at various stages of his career. He also acts as director of medical education for the Dudley Group. Like his predecessor, he has also worked tirelessly to deliver high quality undergraduate education. We normally host around 120 medical students at any one time. The majority of these are clinical placements in third, fourth and fifth year. We also support second year students on their “Hospital Preparation course”. Although not based at the undergraduate centre, the Trust also has a number of students from other disciplines and medical schools. We use a wide variety of teaching methods, including traditional lectures, seminars, study days, bedside teaching and simulation sessions. We first opened to medical students in August 2005. In March 2006, the centre was officially opened by Dean of The University of Birmingham medical school, Professor William Doe. The centre is named in honour of the late Ron Grimley as a tribute to his work and commitment to medical education. As one of the regional centres for the University of Birmingham medical school, we also host third, fourth and fifth year OSCE exams. You can also connect with us on the following social media channels. This site uses functional cookies and external scripts to improve your browsing experience. This website uses category 2 performance cookies to collect information about how visitors use a website, for instance which pages visitors go to most often, and if they get error messages from web pages. These cookies don’t collect information that identifies a visitor. All information these cookies collect is aggregated and therefore anonymous. It is only used to improve the performance and experience of the website. The data collected is limited to RGUC’s use only, for managing the performance, functionality and design of the website. These cookies can be third-party cookies but the information is for the exclusive use of the RGUC website. By clicking "Accept Cookies" on the RGUC website you agree that we can place these types of cookies on your device.